This committee proposes, plans and implements interesting events which will where possible, support and not compete with activities already present in the village. 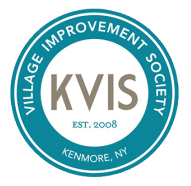 The events planned add to a positive sense of community, are enriching and fun, with some events raising necessary funds for the KVIS. Hello! I grew up in Kenmore where I graduated from Kenmore West High School and moved on to get my associates degree in Social Sciences from Erie Community College. The Village of Kenmore is a truly unique place that is filled with thoughtful people who are good neighbors to one another. I find great satisfaction in helping to continue to bring meaningful, quality events to my Kenmore neighbors and the Western New York community. The Events Committee meets the 2nd Monday of each month at 7 pm and at other times as needed. The KVIS Children’s Concert Series is held on Tuesday evenings for five consecutive weeks. The free concerts, held on the lawn of Kenmore Middle School, attract families from the Kenmore and Tonawanda area and all over WNY, even as far as Lockport, Hamburg, and southern Ontario.